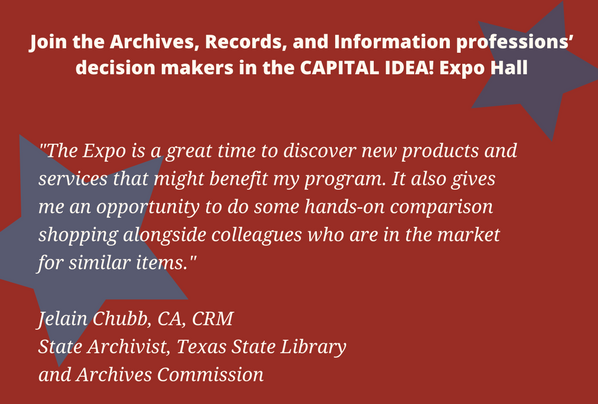 The International Archives and Information Technology Expo is the place for archives, records management, and IT professionals to learn about your products and services, ask questions, and provide marketplace perspectives. The Expo brings together — in one place and at one time — the purchasing decision makers at the national, state, and local levels. Contact Us for more information or to add your name to the annual prospectus mailing list. The stage is set...in August 2019, Austin will be transformed into the ARCHIVES * RECORDS capital of the world! 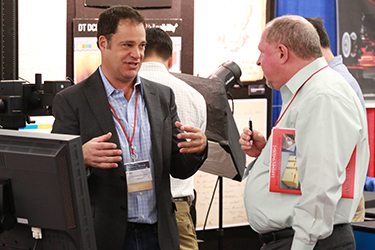 Live and in Person, you’ll have access to the year’s largest audience of archives, records, and information professionals who are eager to learn about your products and services, ask questions, and provide their perspectives. The GREAT IDEAS! Expo brings together—in one place and at one time—the purchasing decision makers at the national, state, and local levels. Take advantage of their great ideas—and share a few of your own! Why Exhibit at the GREAT IDEAS! Expo? For the HOT PROSPECTS, of course! Find your target audience among more than 2,000 archives, records, and information management professionals representing government, universities, libraries, corporations, religious institutions, museums, and more. Hear what archives, records, and information management professionals have to say about your products – and their future product needs. You’ll have lots of opportunities to interact with your current and prospective customers! Attendees will be drawn to the Hall for the Grand Opening Happy Hour on Sunday evening and three events on Monday: Morning Coffee Break, the All-Attendee Lunch, and the hour-long Last Chance Break. And each exhibit booth qualifies for two complimentary full conference registrations so that your representatives have a chance to interact with attendees throughout the meeting. A company profile in the Onsite Program, online schedule, and mobile app. *Please Note! 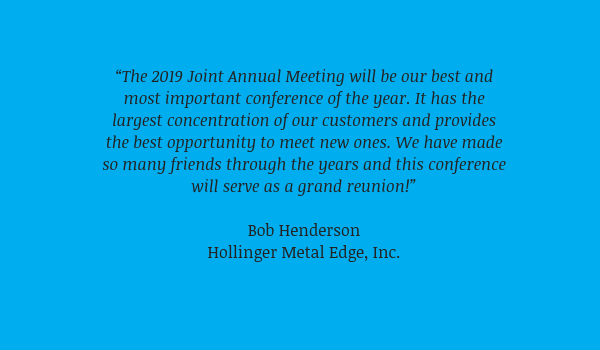 The 2019 Joint Annual Meeting will take place on different days of the week than in previous years. Education sessions will be held on Sunday, Monday, and Tuesday (August 4–6) rather than from Thursday to Saturday. Other aspects of the schedule may change as well. Look for a preliminary schedule of events in January 2019. Enhance your exposure – and make the most of your marketing dollars! – by sponsoring an event. At the GREAT IDEAS! 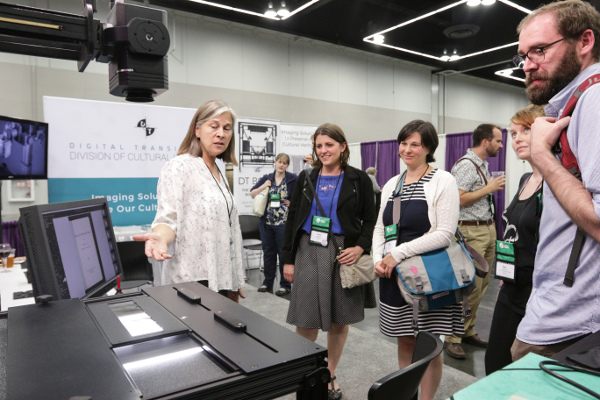 Expo you’ll share your message with more than 2,000 archives, records, and information management professionals from around the world. Attendees enjoy a week-long program of workshops, education sessions, networking opportunities, and special events. Sponsorship provides an opportunity to increase your exposure and take your commitment to the next level! We're delighted to work with you to create a sponsorship opportunity that meets your company’s marketing goals and budget. A conference Sponsorship offers major contributors a special opportunity for recognition before, during, and after the conference. You’ll gain great visibility and have the chance to mingle with the profession’s thought leaders, supporters, and staff. Or you may want to enhance your Expo Hall exposure by sponsoring individual events or take-away items that are memorable for conference attendees. We’re happy to work with you to develop a sponsorship package that meets your marketing goals and budget. Contact Carlos Salgado (866-722-7858, ext. 215, or csalgado@archivists.org) to discuss the following – or your own great idea! Increase your visibility at ARCHIVES * RECORDS 2019! Now you can enhance your marketing message to attendees and prospects – before, during, and after the conference! All eyes are on the conference website, and advertising to members and prospective attendees is a great way to reach your target audience and reinforce your marketing message. Prospective attendees review it to determine whether they’ll attend the conference – and to register. Speakers set up their profiles. Registrants return to the website again and again to see what’s been added to the program and to create their own schedules. Your ad will run on each page of the conference website and direct visitors to the landing page of your choice to expedite purchases! (Please note that your ad will rotate with other ads.) This marketing opportunity is limited to confirmed exhibitors. The preliminary program flyer is available to more than 7,000 current CoSA and SAA members as well as past meeting attendees and archives, records, and information professionals who live and work within 500 miles of the conference site. It's a major tool that prospective attendees use to determine if and when they will attend the meeting. This marketing opportunity is limited to confirmed exhibitors. Limited space available. The Onsite Program will be referred to again and again during the conference and then will remain on the shelves of more than 2,000 conference attendees as a reference. This marketing opportunity is limited to confirmed exhibitors. BACK BY POPULAR DEMAND! 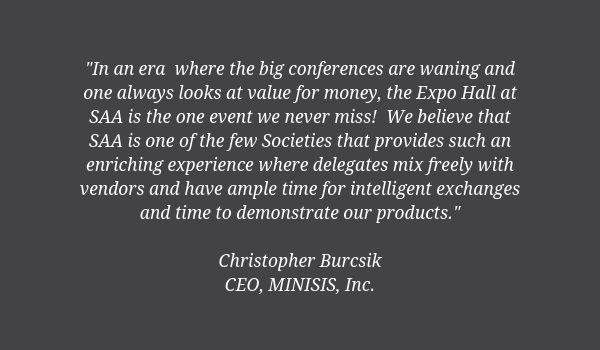 The Expo Hall Mini-Theater gives you another opportunity to increase your exposure and share your message! Exhibitors and sponsors may reserve 30 minutes during unopposed Expo Hall events, when most attendees are in the Hall. This is your time – outside your booth – to educate attendees and promote your products/services. (Please note that all booths must be staffed during Expo Hall hours.) A microphone, LCD projector, and screen will be available to support your presentation. Fee: $200 per 30-minute presentation. Now you can enhance your exposure – and make the most of your marketing dollars! – by sponsoring an event. At the CAPITAL IDEA! Expo you’ll share your message with more than 2,500 archives, records, and information professionals from around the world. Attendees enjoy a week-long program of workshops, education sessions, networking opportunities, and special events. Sponsorship provides an opportunity to increase your exposure and take your commitment to the next level! Welcome! The CAPITAL IDEA! Virtual Expo is where you can view a live, real-time floor plan showing currently available booths – and you can select and confirm your booth location immediately to be sure that you get the best available location. Space will be assigned on a first-come, first-served basis (excluding those booths reserved for conference sponsors) upon receipt of full payment. We encourage you to sign up soon, as we expect the CAPITAL IDEA! Expo to be a sell-out! For inclusion of your listing in the Onsite Program, your application and payment must be received by May 18, 2018. Remember: A completed contract and full payment are required to secure your booth location. Note that certain fees from the Marriott Wardman Park Hotel and Alliance Exposition Services will apply. Exhibitor Registration: You may pick up your name badge(s) on Thursday, August 16, between 1:00 pm and 5:00 pm. Exhibitor Move-in: You will be allowed into the Expo Hall to start setting up your booth at 1:00 pm on Thursday, August 16. All displays must be fully set up and ready by 4:30 pm on Thursday. Show Hours: Thursday, August 16, 5:30 pm – 7:00 pm and Friday, August 17, 8:00 am – 5:00 pm. Tear Down: Friday, August 17, 5:00 pm – 7:00 pm. In July 2017, Portland will become the ARCHIVES capital of the world! You’ll have access to the year’s largest audience of archives, records, and information professionals who are eager to learn about your products and services, ask questions, and provide their perspectives. 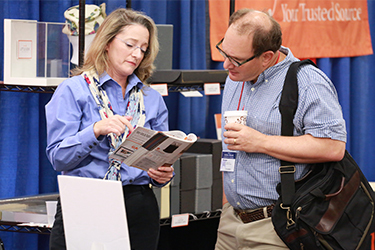 The ARCHIVES 2017 Expo brings together—in one place and at one time—the purchasing decision makers at the national, state, and local levels. Take advantage of their great ideas—and share a few of your own! The ARCHIVES 2017 Expo is your best opportunity all year to reach your target audience! Find your target audience among more than 1,800 archives, records, and information professionals representing government, universities, libraries, corporations, religious institutions, museums, and more. Visit the Virtual Expo now to confirm your booth—before your competition does! Visit the Virtual Expo, where you can view a live, real-time floor plan showing currently available booths—and select and confirm your booth location immediately to be sure that you get the best available location. Welcome! The ARCHIVES 2017 Virtual Expo is where you can view a live, real-time floor plan showing currently available booths – and you can select and confirm your booth location immediately to be sure that you get the best available location. Space will be assigned on a first-come, first-served basis (excluding those booths reserved for corporate sponsors) upon receipt of full payment. We encourage you to sign up soon, as we expect the ARCHIVES 2017 Expo to be a sell-out! For inclusion of your listing in the Onsite Program, your application and payment must be received by May 15, 2017. Note that certain fees from the Oregon Convention Center and Alliance Exposition Services will apply. Exhibitor Registration: You may pick up your name badge(s) on Thursday, July 27, between 10:00 am and 4:00 pm. Exhibitor Move-in: You will be allowed into the Expo Hall to start setting up your booth at 1:00 pm on Thursday, July 27. All displays must be fully set up and ready by 4:30 pm on Thursday. Show Hours: Thursday, July 27, 5:30 pm – 7:00 pm and Friday, July 28, 8:00 am – 5:00 pm. Tear Down: Friday, July 28, 5:00 pm – 7:00 pm. BACK IN 2017! The Expo Hall Mini-Theater gives you another opportunity to increase your exposure and share your message! Exhibitors and sponsors may reserve 30 minutes during unopposed Expo Hall events, when most attendees are in the Hall. This is your time – outside your booth – to educate attendees and promote your products/services. (Please note that all booths must be staffed during Expo Hall hours.) A microphone, LCD projector, and screen will be available to support your presentation. Fee: $200 per 30-minute presentation. Receive 50% off when you reserve by February28 offer extended to March 24! New exhibitors may add a 30-minute mini-theater presentation during the booth reservation process. Current exhibitors may purchase by logging in to your booth profile. Increase your visibility at ARCHIVES 2017! Now you can enhance your marketing message to ARCHIVES 2017 attendees and prospective attendees – before, during, and after the conference! All eyes are on the conference website once the program goes live on April 15. Prospective attendees review it to determine whether they’ll attend the conference and to register. Speakers set up their profiles. Registrants return to the website again and again to see what’s been added to the program – and to create their own schedules. Your ad will run on each page of the conference website, with a link to your company website or your 2017 Virtual Expo listing – you choose! (Please note that your ad will rotate with other ads.) This marketing opportunity is limited to companies that exhibit at ARCHIVES 2017. The preliminary flyer is available to more than 6,200 current SAA members as well as past meeting attendees and archives, records, and information professionals who live and work within 500 miles of the conference site. It includes the meeting schedule and is the major tool that prospective attendees use to determine if and when they will attend the meeting. This marketing opportunity is limited to companies that exhibit at ARCHIVES 2017. Limited space available. Attendees love the conference website and the mobile app – but they still want their print program! 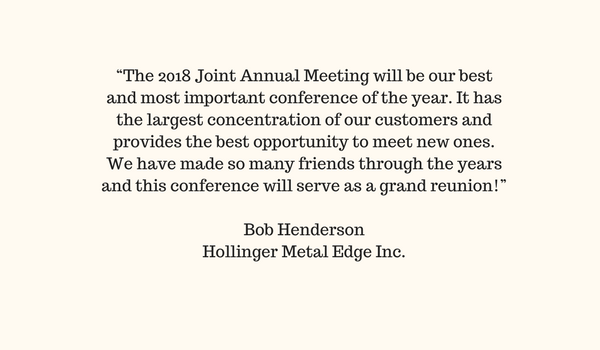 The Onsite Program will be referred to again and again during the conference and then will remain on the shelves of more than 1,800 conference attendees as a reference. This marketing opportunity is limited to companies that exhibit at ARCHIVES 2017. Increase your visibility by advertising in the ARCHIVES | New Orleans 2013 Programs! Now you can increase hits for your marketing message by placing an Online Ad on the ARCHIVES | New Orleans 2013 conference website - where it will be seen by presenters, conference registrants, and those who are deciding whether to attend. Your "button" ad will run on each page of the conference website and will link to your company website or to your 2013 Virtual Expo listing (including your contact information and product description); you choose! This marketing opportunity is limited to companies that exhibit at ARCHIVES | New Orleans 2013. Please see the Sponsor section of the prospectus to view the MeetSmart Mobile App Show Guide Sponsorship and Advertising options. Go "Beyond Borders" in 2012! Sign up by January 31, 2012, and SAVE up to $400! SAA’s 2012 Annual Meeting will convene August 6–11 in the spectacular beauty and diversity of San Diego, California. 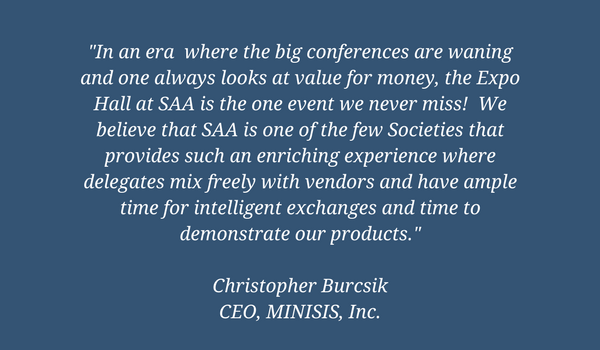 We invite our industry partners to join SAA as we explore moving beyond the imaginary borders of our past and leveraging the knowledge, experience, and opportunities that lie ahead…. 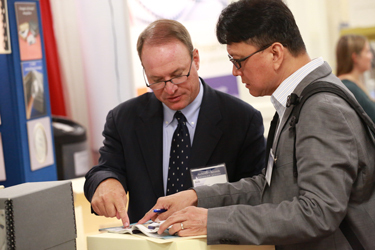 The Beyond Borders EXPO Is the place for archives, records, and IT professionals to learn about your products and services, ask questions, and provide their marketplace perspectives. The Expo brings together – in one place and at one time – the purchasing decision makers at the local, state, and national levels. Take advantage of their great ideas – and share a few of your own! Find your target audience among more than 2,000 archives, records, and IT professionals representing libraries, universities, government, corporations, religious institutions, museums, and more. Develop relationships with archives, records, and IT professionals from the United States and throughout the world. Hear what archives, records, and IT professionals have to say about your products – and their future product needs. Increase your knowledge and understanding of the archives and records professions. Enjoy 10 hours of conveniently scheduled exhibit time, of which a full 5½ hours is unopposed by education programming. You’ll have lots of time to interact with your current and prospective customers as the feeding frenzy continues! Attendees will be drawn to the Expo Hall for the Grand Opening Happy Hour on Thursday evening, the All-Attendee Brunch on Friday, and the hour-long “Last Chance” Break on Friday afternoon. Visit the Virtual (Online) Expo now to confirm your booth! Don’t miss the opportunity to select a booth – before your competition does! Join us for Beyond Borders … for one great idea after another! Your company listing on the conference website – as soon as your reservation is complete – with an optional link to your site. Exposure to all registered attendees in monthly promotional email messages from SAA leading up to the Annual Meeting. A complete list of pre-registered attendees, with address information. One fully piped and draped exhibit space (8-foot back wall drape and 3-foot side rail drape), one skirted 6-foot table, two side chairs, one wastebasket, and one 7” x 44” identification sign. Increase your exposure! Add a color logo to your Virtual Expo (online) listing for just $100. Now you can confirm your booth location immediately! We’ve set up an online website (Virtual Expo) for Beyond Borders where you can view a live, real-time floor plan showing currently available booths – and you can select and confirm your booth location immediately to be sure that you get the best available location. Go to the Virtual Expo to reserve your booth now. Space will be assigned on a first-come, first-served basis (excluding those booths reserved for corporate sponsors) upon receipt of full payment. We encourage you to sign up soon, as we expect the Beyond Borders Expo to be a sell-out! For inclusion of your listing in the Onsite Program, we must receive your application by May 31, 2012. A signed contract and full payment are required to secure your booth location. View a printable Application and the Exhibit Rules and Regulations (PDF). Note that certain fees from the Hilton San Diego Bayfront will apply. *SAA reserves the right to alter the meeting schedule. Welcome to the Beyond Borders Virtual Expo! Now you can confirm your booth location immediately! We’ve set up the Beyond Borders Virtual Expo, where you can view a live, real-time floor plan showing currently available booths – and you can select and confirm your booth location immediately to be sure that you get the best available location. View a layout of the expo space. 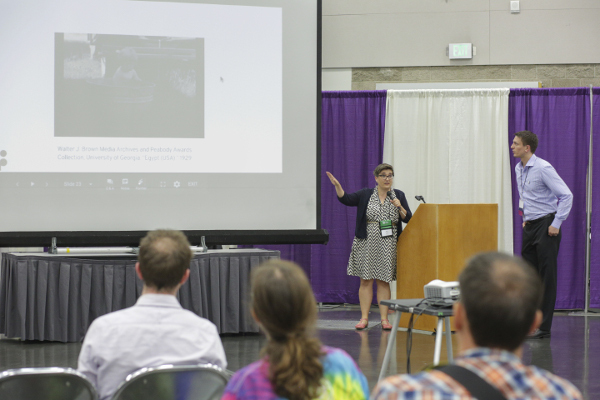 At Beyond Borders, you’ll share your message with more than 2,000 archives, records, and IT professionals from around the world. Attendees enjoy a week-long program of workshops, education sessions, networking opportunities, and special events. Here’s your chance to increase your exposure and take your commitment to the next level! The conference organizers are delighted to work with you to create a sponsorship opportunity that meets your company’s marketing goals and budget. Includes Welcome Page, Footer, company listing on Sponsor page with logo and URL, and two advertising alerts. Mobile App Show Guide sponsorship may be added during the booth selection check-out process or by completing the application form PDF. For complete information about sponsorship opportunities – or to begin customizing your own sponsorship – please contact: SAA Executive Director Nancy Beaumont(866.722.7858, nbeaumont@archivists.org) or Service Center Manager Carlos Salgado (866.722.7858, csalgado@archivists.org). Increase your visibility by advertising in the Beyond Borders Programs! NEW for 2012! Now you can increase hits for your marketing message by placing an Online Ad on the Beyond Borders conference website - where it will be seen by presenters, conference registrants, and those who are deciding whether to attend. Your "button" ad will run on each page of the conference website and will link to your company website or to your 2012 Virtual Expo listing (including your contact information and product description); you choose! This marketing opportunity is limited to companies that exhibit at Beyond Borders. Sign up by January 31, 2011, and SAVE up to $200! ARCHIVES 360° — Your Best Opportunity All Year to THINK BIG! The THINK BIG! 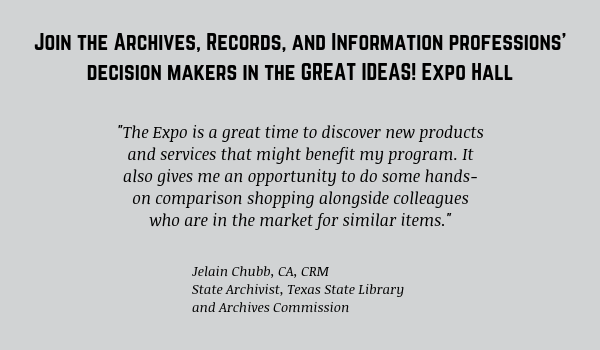 EXPO Is the place for Archives, Records, and IT Professionals to learn about your products and services, ask questions, and provide their marketplace perspectives. ARCHIVES 360° brings together – in one place and at one time – the purchasing decision makers at the local, state, and national levels. Take advantage of their BIG IDEAS – and share a few of your own! Find your target audience among more than 2,000 archives, records, and IT professionals representing corporations, government, libraries, universities, religious institutions, museums, and more. Join us for ARCHIVES 360° … for one BIG IDEA after another! Two free conference registrations with each 8 x 10 booth (a $1,000 value!). Your representatives will have a chance to interact with conference attendees at education sessions and networking events throughout the meeting – including SAA’s 75th Anniversary celebration! Your company listing on the ARCHIVES 360° website – as soon as your reservation is complete – with an optional link to your site. A complete list of pre-registered attendees, including one-time use of email addresses. Now you can confirm your booth location immediately! We’ve set up an online website (Virtual Expo) for ARCHIVES 360° where you can view a live, real-time floor plan showing currently available booths – and you can select and confirm your booth location immediately to be sure that you get the best available location. Go to the Virtual Expo to reserve your booth now. Space will be assigned on a first-come, first-served basis (excluding those booths reserved for corporate sponsors) upon receipt of full payment. We encourage you to sign up soon, as we expect the THINK BIG! Expo to be a sell-out! For inclusion of your listing in the Onsite Program, we must receive your application by May 19, 2011. Welcome to the ARCHIVES 360° Virtual Expo! Now you can confirm your booth location immediately! We’ve set up the ARCHIVES 360° Virtual Expo, where you can view a live, real-time floor plan showing currently available booths – and you can select and confirm your booth location immediately to be sure that you get the best available location. At ARCHIVES 360°, you’ll share your message with more than 2,000 archives, records, and IT professionals from around the world. Attendees enjoy a week-long program of workshops, education sessions, networking opportunities, and special events – including in 2011 SAA’s grand 75th Anniversary celebration! Here’s your chance to increase your exposure and take your commitment to the next level! The conference organizers are delighted to work with you to create a sponsorship opportunity that meets your company’s marketing goals and budget. A Corporate Sponsorship offers major contributors a special opportunity for continued recognition before, during, and after ARCHIVES 360°. You’ll gain great visibility and have the chance to mingle with the profession’s thought leaders, supporters, and staff. In these tough economic times, your company may prefer to sponsor individual events or take-away items that are sure to be memorable for conference attendees. We’re happy to work with you to develop a sponsorship package that meets your marketing goals and budget. Opportunities range from $3,000 to $20,000 – and may include the ever-popular Cyber Café, hotel key cards, breaks, receptions, plenary AV support, special food events, transportation, and other creative ideas. All sponsors will be listed in the Onsite Program and on the conference website as soon as sponsorship is confirmed. Increase your visibility by advertising in the ARCHIVES 360° Preliminary and Onsite Programs! The Preliminary Program is sent to more than 5,900 current SAA members, as well as past meeting attendees and archives, records, and IT professionals who live and work within 500 miles of the conference site. It includes complete information about the meeting content and is the major tool that prospective attendees use to determine if and when they will attend the meeting. The Onsite Program will be referred to again and again during the conference and then will remain on the shelves of more than 2,000 conference attendees as a reference throughout the years….